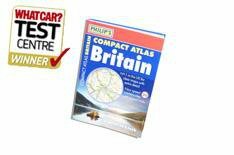 8th Philip's Compact Atlas Britain 9.99 | What Car? This small, near A5-sized atlas combines the convenience of 1:200,000 scale mapping and a hand-held book. There are downsides, though - the scale means that you'll be turning pages frequently on a long journey. The town maps are good and the indexing is top-notch. Speed camera locations are marked with speeds. This atlas has a glued spine with plastic laminated covers. That presents one major downside, because some of the mapping does disappear into the seam between pages. However, you'll have no problem finding the relevant pages, because each section is colour-coded. It's not cheap, so it's fighting for sales with larger-format books. However, the information and presentation are on a par with many of these rivals, and the handy door-pocket size will be seen as a benefit by many. This is a well-made publication, with high-quality covers and thick paper that should be tear-resistant. Don't mistake its small dimensions for a lack of quality. There aren't any jazzy extras, but what this atlas does, it does really well. The index is comprehensive without being overwhelming, the 21 city maps are detailed and the speed camera locations are marked with the speed limits.